Nothing beats the taste of seasonal produce! Even though peppers are available year-round, they do seem sweeter and are so plentiful in summer. 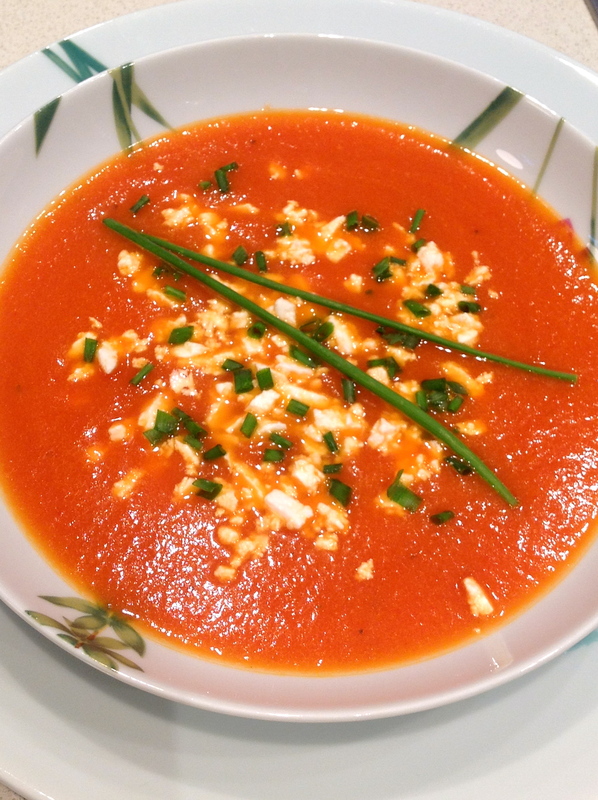 The combination of this soup: the sweet roasted peppers with the tangy, salty feta and chives on top, is utterly delicious. Preheat the oven to 400°F/ 200°C. Place the whole peppers on a baking sheet and roast uncovered, turning as needed for approx. 30 minutes until skin is just about blackened on all sides. Place the peppers in a large bowl and cover with plastic wrap or place in paper bag and seal. Let the peppers stand and cool off for 10 minutes. In the meantime chop the onion, mince the garlic and get the vegetable stock ready. Now that the peppers have cooled off, peel off the skin and remove the top and the seeds. Heat the olive oil in your stockpot over medium heat, sauté the onion and when they are about done add the garlic. Once translucent, add the roasted peppers and the can of chopped tomatoes and simmer for 5 minutes. Add the vegetable stock, cover and cook for 15 minutes, stirring occasionally. Turn off the heat and let the soup cool down for a few minutes. Purée the ingredients with a hand blender in the stockpot or puree in batches in your blender. Return the soup to a clean pan and season to taste with salt, ground paprika and coarsely ground pepper. When ready to serve, bring back to a simmer and ladle in to bowls. Sprinkle the crumbled feta cheese and chives on top. 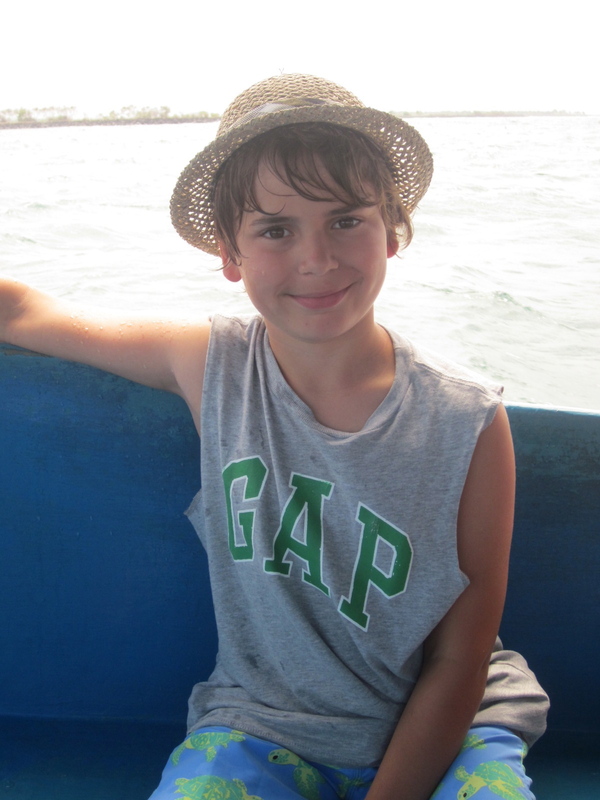 This week I like to share my recipe for a very tasty and nutritious chowder. 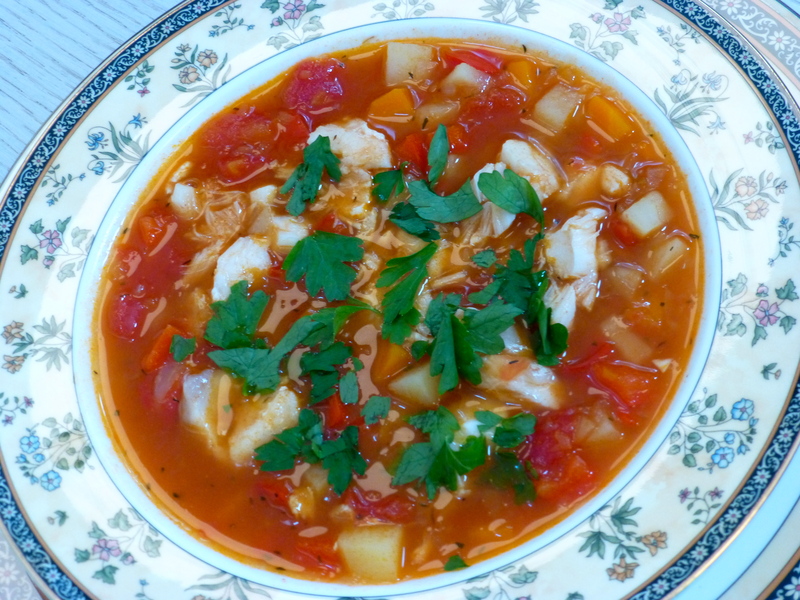 The potatoes, vegetables and chunks of cod make it a rather filling soup and for us a perfect summer meal. I don’t use any cream or milk in this chowder, which makes it perfectly suitable for anyone who has lactose intolerance too. The combinations of ingredients makes it a very natural, healthy and flavorful dish, enjoy. Melt the butter on medium heat in your stockpot. Sauté the onions and when they are about done add the garlic, ground cumin and dried thyme. Once translucent add the diced carrots, potatoes and red peppers. Stir and cook over medium heat for 10 minutes until lightly golden and soften. In the meantime, lightly season the cod fillets with salt and black pepper and set aside. Add the chopped tomatoes, bay leaves and stock to the diced vegetables. Stir, cover and simmer for another 10 minutes. Lay the cod fillets on top of the vegetables and cover the stockpot. Simmer for a few minutes until the fish is just cooked through. Before serving, remove the bay leaves, and season the soup with salt and pepper. Ladle the soup into the bowls and place flakes of the cod on top of the soup. Sprinkle the fresh leaf parsley and serve immediately. This version of Turkish lentil soup is home cooking at its best: healthy, hearty, easy and scrumptious delicious. I prefer to use (organic) red split lentils as they cook quicker than regular lentils. This soup is perfect to serve as a main meal by adding a piece of Turkish pide bread and a salad. Heat the olive oil on medium heat in your stockpot. Sauté the onion and when they are about done add the garlic, diced carrot, one teaspoon of ground cumin, one teaspoon of ground paprika and 2 tablespoons of tomato purée. Toss the ingredients until all ingredients are covered with the flavour of each item and cook for another 5 minutes. Add the washed and drained lentils, pour in your stock and bring to boil. Once boiling reduce the heat and simmer for 25 minutes or until the carrots and lentils are tender. Turn off the heat and let the soup cool down for a few minutes. Place all but 3 cups of the soup into a blender or food processor and blend. Return the pureed soup to your pan and stir in the reserved cups of soup. Season to taste with salt and coarsely ground pepper. Serve each bowl with a lemon wedge and garnish with fresh mint. I have a confession to make: when it comes to stocks I’m happy to use stock cubes, pots, pouches or powder. It saves a lot of time and before you know it you have your vegetable, chicken or beef stock ready to use. However, as I am writing about soups, 52 recipes in 52 weeks, it is time to start making my own stock, fresh from scratch. Stocks are a base for soups but are also used for sauces, stews, pastas and risotto. 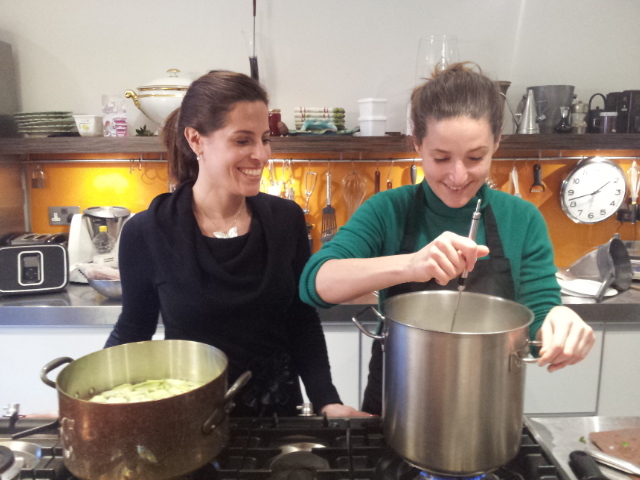 Fortunately, one of my dear friends Esther from Sugar and Salt is a true chef and was happy to demonstrate how to make a delicious stock step-by-step. Pour 2L of cold water into the stockpot. Add the onion, celery, carrots, garlic, leek, fennel, white peppercorns and fennel seeds and bring to a boil. Once boiling reduce heat and simmer for 30-45 minutes. Turn off the heat and let the stock cool down for a few minutes. Transfer the stock to a bowl or container and add the parsley, chervil, dill and tarragon. Chill overnight and strain the next day. Your stock is ready to use. You can keep the stock in your fridge for a week and in the freezer for up to 3 months. If you freeze it you can use an ice tray and once the stock is frozen transfer the cubes to a plastic bag or pour small quantities in Ziploc plastic bags so you will have ‘sheets’ of frozen stock which will defrost quickly as well. Place all ingredients into a large pan/stockpot and cover with water. Bring to the boil and skim off any impurities that rise to the surface. Continue to simmer gently for one and a half hour and keep skimming if necessary. Then pass the stock through a fine sieve and allow to cool for about half an hour, then refrigerate. You can keep the stock in your fridge for about 3 days and in the freezer up to 3 months.